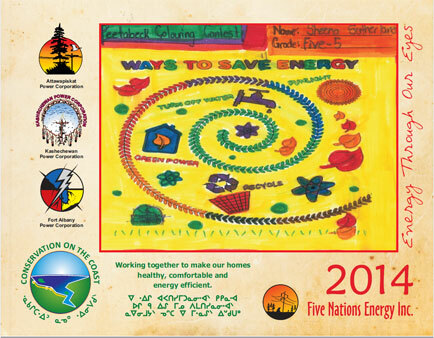 Postcards were printed with community members’ Energy Efficient clothes washing tips – mailed to everyone. 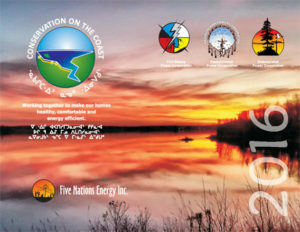 Redeemable for a free jug of Sunlight cold water detergent at local Northern Stores. 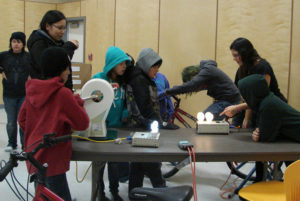 For three winters between 2011 to 2013 the children of Attawapiskat, Kashechewan and Fort Albany each received a half-day, hands-on science lesson in their classrooms. 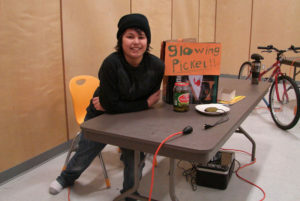 Each year culminated in a community Energy Fair where everyone was invited to share with the children what they learned about energy production and conservation. This FNEI Program contributed funds to the schools to engage the educational organization Elephant Thoughts to deliver the classroom training and to host the Energy Fairs. In 2011 under the FNEI Conservation Program we purchased 3M Window Kits, one for each home in all three communities. 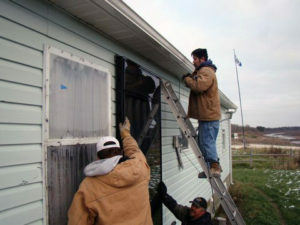 Each box contained enough plastic and tape to cover at least 7 windows. The product installs over the windows inside the home, and when properly adhered makes an airtight seal, stopping all air leakage and condensation. 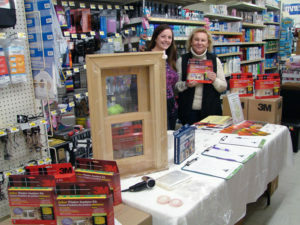 A great way to keep your home warmer and to avoid mold growth on window ledges. 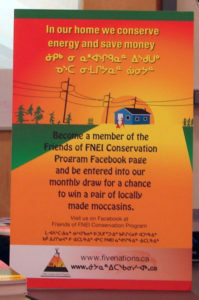 The FNEI program kits were handed out over one day in each community’s Northern Store. 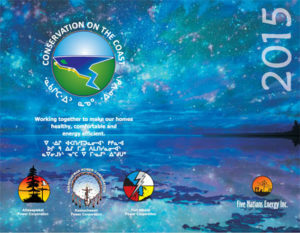 The remaining boxes were distributed by the housing managers. The product can be reused year after year if handled carefully. In 2012 the Belleville Rotary Club donated the funds to purchase this solar thermal wall unit. A home in Fort Albany, with no obstructions to the winter sun, was chosen for the pilot project. 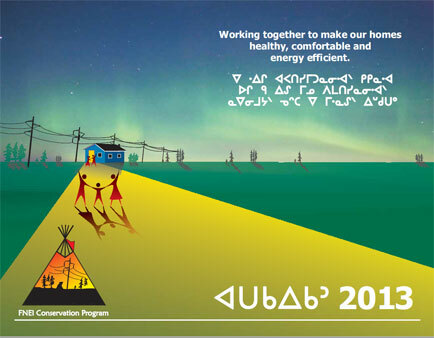 The unit uses no electricity to operate and provides free heat to the home. How does it work? A solar panel at the top turns on a small fan when the sun shines on the unit, drawing air from inside the home into the larger part of the panel, the sun heats the home’s air and the fan helps push the heated air back into the home. A thermostat on the inside of the home controls how much free heat transfers to the home. The unit can be switched off for the summer. Solar thermal walls can be mounted on rooftops as well. 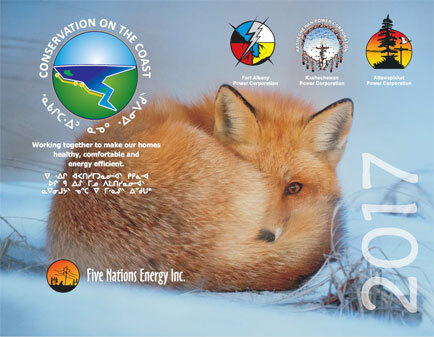 It is hoped that additional funding could be found to purchase several more units to test their effectiveness to reduce winter power bills. 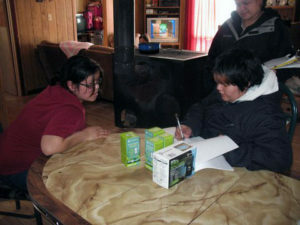 Installing the solar panel on a Fort Albany home. 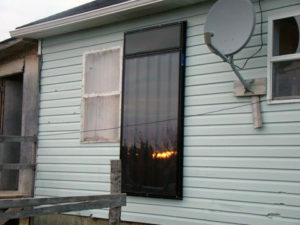 Working solar panel on a Fort Albany home. 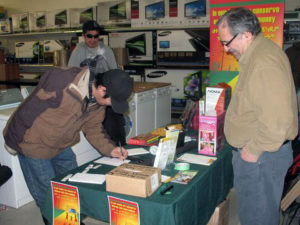 Asking community members for energy-saving tips. 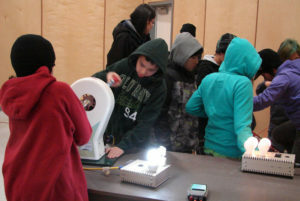 Surveying homes’ occupants about their energy use. FNEI hired local workers to install a variety of energy efficient products, such as low flow shower heads and aerators, CFL bulbs, block heater timers etc. in all homes. 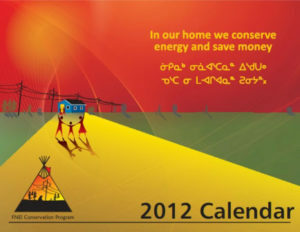 We produced a series of calendars with energy-saving tips and conservation-related artwork and messages from local people. You can view the covers here, or download some of the calendars in PDF format below. 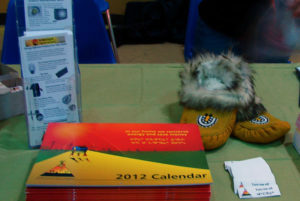 Shipping product to Kashechewan First Nation: items must be flown in.